A enormous ply wood disk with a cut out image. 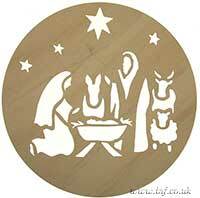 The cut out image of the nativity manger scene wit Mary and Joseph around the crib with some animals looking on. Size 42cm diameter and 3mm thick.